Fresh, vegetable-oriented Mexican food leaves diners wholesomely satisfied. 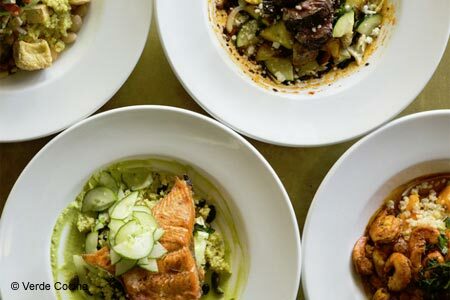 : You won't find a more "Portland" version of Mexican food than at this cheery Pearl District eatery, which is heavily influenced by its farmers market origins. The atmosphere of the cozy space, open to the street on warmer days, is relaxed and welcoming. Everything is gluten-free, ensuring vegans, vegetarians and the Paleo crowd will all find plenty to enjoy. But don't expect searing heat or towers of melted cheese, meat and beans. With the exception of the sautéed tofu chicharones in incendiary salsa, flavors are mild, seasoned by herbs more than chiles. Portions are ample, with white bean garbanzo mash and mounds of sautéed vegetables accompanying most dishes. Start with tortillas, made fresh all day in the open kitchen and ideal for scooping up chunky guacamole. “Paella" is closer to risotto, and boasts a light tomato broth full of seafood. We like the carne asada, the mole sauce, and any of the many selections of tofu mole. Simple dishes such as quesadillas, banal in many restaurants, are elevated by the quality of their basic ingredients; don't miss the one with butternut squash. Brunch offers egg dishes crafted with farm-fresh eggs, while the bacon tastes both meaty and sweet. A kids’ menu is also available. For drinks, choose from many margaritas, including a refreshing pineapple ginger version, or the tequila sampler with numerous unusual varieties.